Referred to as the "King of Kings"
Referred to as "Gods only begotten son"
Known as "Lamb of God", "The Light"
It does seem to be some uncanny relations between these different Gods and I do consider Jesus to be a God or the God, though I understand it is a little more complex than that summation. But for the sake of clarity of the question I am just addressing Jesus as a God. I have heard references to astrology in driving some of these coincidental factors such as the Star in the East, December 25th and even maybe Sunday as the day of praise for some Gods of history. But what about the 12 disciples, virgin birth, miracles, crucifixion, 3 day death and resurrection. These aspects of multiple Gods' stories from different societies transcend particular star patterns and celestial movements. Is there perhaps a historical influence from older societies on the stories in the Bible or perhaps maybe there are some natural human psychological tendencies for purity (virgin birth) and guilt (crucifixion) and ego (desire for a survivor who was born from purity and made to suffer that is one of us, is human) that drives humans to tell these spiritual tales to comfort the very minds that create them. 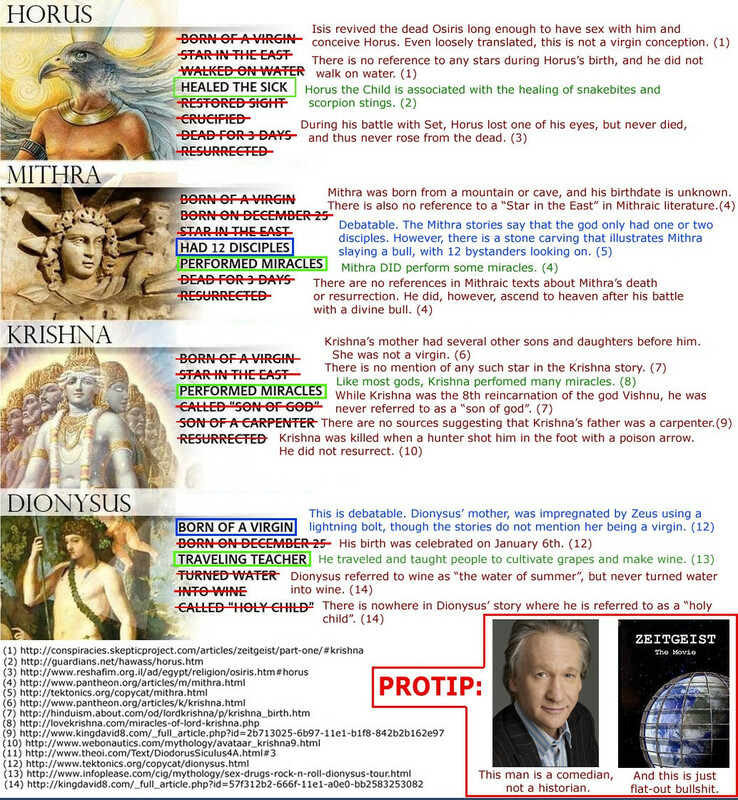 It seems that there are actually not as many similarities as certain people on the internet would like you to believe. Your source has more than a few issues; I'm not going to worry about the specific details raised (many of which are answered with a simple "false") but paint in broad strokes to attempt to answer the question behind the question. Many similarities between Jesus and other gods are superficial, and others may have actually borrowed from the life of Jesus. The cult of Dionysus, for example, did not fully develop until the 3rd or 4th century after Jesus. This naturally raises the question, "who borrowed from whom?" 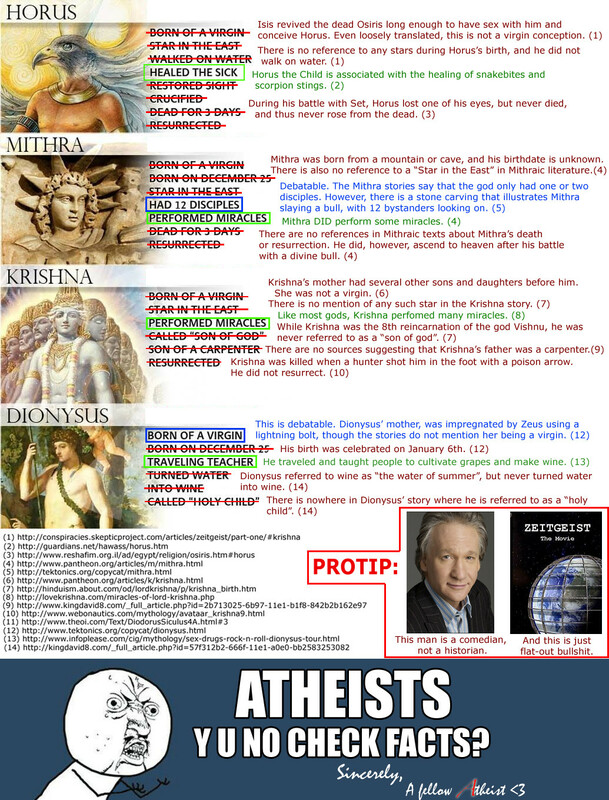 One of the big differences between Jesus and the rest is that his existence is virtually undisputed; you may find a scholar or two that believes Attis was based on a real person, but to my knowledge, nobody claims that Attis actually existed in history. Concerning the death and resurrection as symbolism of the harvest, the Jewish followers of Jesus would not have copied the pagan idea of a dying and rising god (I believe it was N.T. Wright that said "if your favorite messiah went off and got himself crucified, you either went home or found yourself another messiah"). These myths are seasonal; the story occurs again and again, while the death and resurrection of Jesus is explicitly a single event occurring in history. Gary Habermas, in a survey of academic publications on the resurrection, found that 75% of scholars accept that Jesus' tomb was actually empty three days after his crucifixion (note that they do not all believe he actually rose from the dead; some have alternative theories (stolen body, etc.))1. Finally, God may have chosen to place glimpses of the truth in various times and cultures so they can recognize it once someone teaches it to them (this is sometimes called fulfillment theology, generally considered to have its origins with Justin Martyr in the second century AD). The Bible gives an example of Paul, introducing the people of Athens to "the Unknown God" they were worshiping ("What therefore you worship as unknown, this I proclaim to you"). If you want an in-depth examination of Christianity and comparative religion, I highly recommend G.K. Chesterton's The Everlasting Man. There is Truth because there is the One True God vs. corruption of the truth, misrepresentation of the truth, misunderstanding of the truth, etc. The two creeds [key word in definition: core] are irreconcilable; therefore both religions cannot be true. If one of them is the true Faith, the other is a corruption of it and therefore not true. For the wrath of God is revealed from heaven against all ungodliness and wickedness of men who by their wickedness suppress the truth. For what can be known about God is plain to them, because God has shown it to them. Ever since the creation of the world his invisible nature, namely, his eternal power and deity, has been clearly perceived in the things that have been made. So they are without excuse; for although they knew God they did not honor him as God or give thanks to him, but they became futile in their thinking and their senseless minds were darkened. 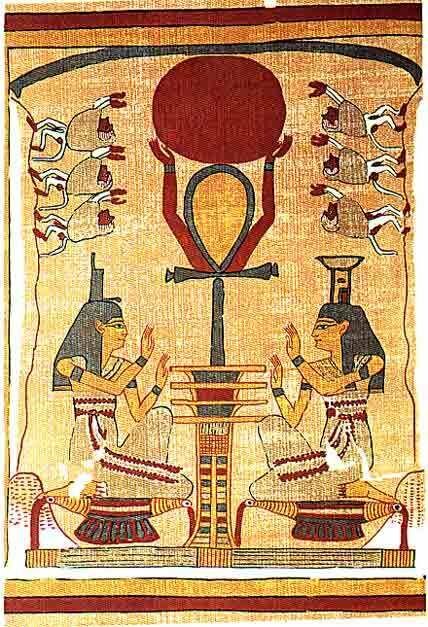 Claiming to be wise, they became fools, and exchanged the glory of the immortal God for images resembling mortal man or birds or animals or reptiles. then it is not hard to see that bad people, especially when under the influence of the demons, can corrupt the truth for wickedness. If the vision was not meant for him/his time, and if St. Peter had taken it upon himself to interpret the vision unauthorized, and then proceed to teach it, then one can see how a wrong interpretation can be started and perpetuated. Was Jesus a sun god? 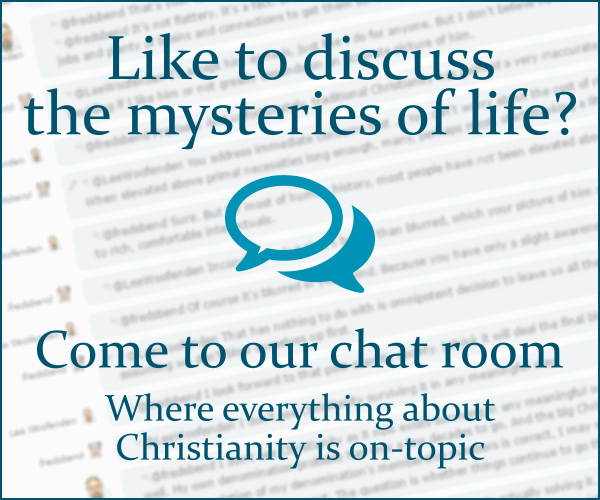 Why are most Christian beliefs match with the spiritual practices of the Ancient Egypt? What extrabiblical sources support the existence of Jesus in history? How do Christians explain commonalities between their religion, other major faiths and obscure isolated tribal belief systems? Does the Bible provide any passages that might help in understanding how Satan became sinful? Is there a group of Christians that believes that Jesus was resurrected metaphorically rather than physically? What is the significance of Bethlehem as the place of Jesus birth? How does Christianity explain suffering that ends in death? Were the similarities between the miracles of Elisha and Jesus deliberate or simply coincidental? What is the basis for the belief that Christianity and Islam worship different gods? Immortal soul concept: why does Bible say Jesus was resurrected after 3 days, as he should never have been really dead?